Making this repurposed felt succulent garden was so much fun. 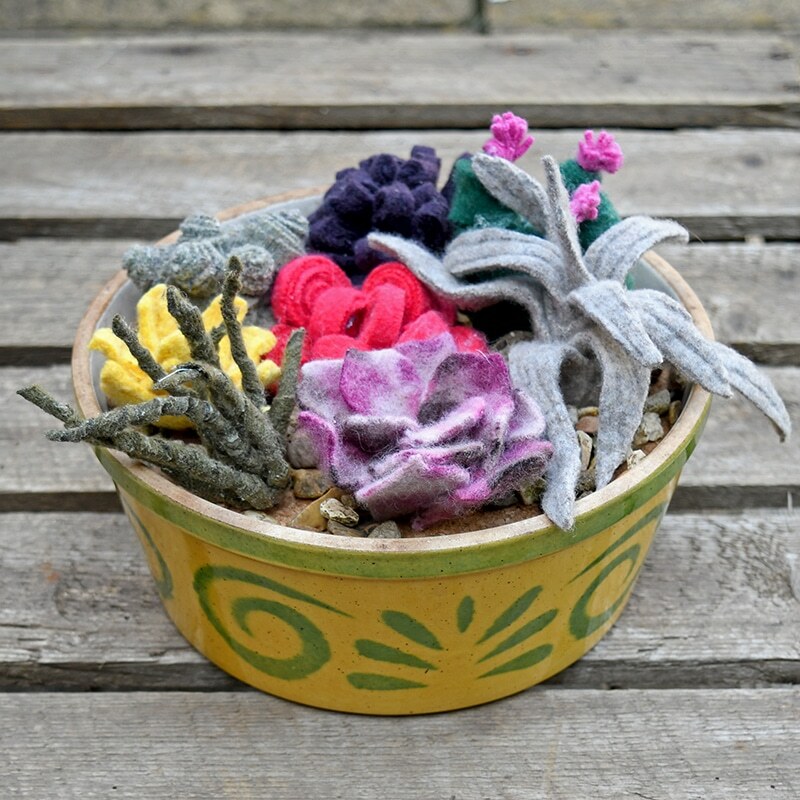 It really got my creative juices going, trying to work out how to make different succulents out of sweater felt scraps. Working out how to mount my succulent garden and upcycling a container to show it off just added to the creative joy. I’m such a craft geek, I get a kick out making lovely things out of repurposed materials. Not only that I get even more of a kick when it’s made with the scraps from other upcycling projects. These weren’t my first faux succulents, I made some super cute tiny ones out of plastic bottles for my upcycled terrariums. 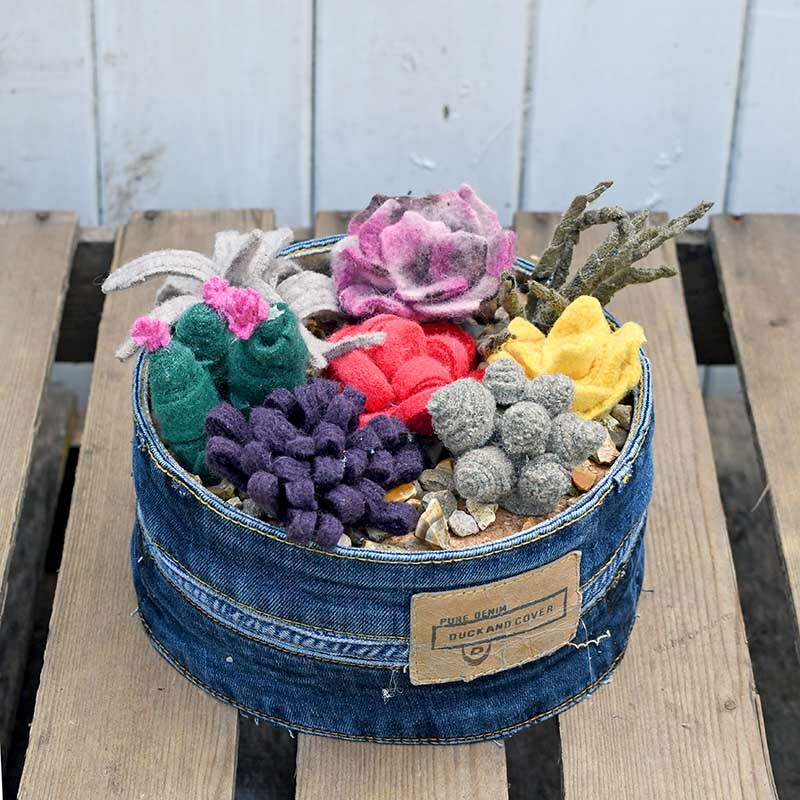 But with these succulents, I delved deep into my bag of sweater felt scraps. Leftover from all my other upcycled sweater projects. I’ve always wanted a faux succulent garden. I’ve seen some amazing crochet succulents and cacti on Pinterest but unfortunately, my crocheting skills aren’t up to recreating one. However, when I spotted this amazing succulent garden made out of quilled paper I got the idea to make my garden out of my felted sweater off-cuts. I have previously made a gorgeous sweater felt rug using a sort of quilling technique. Sweater felt scraps in assorted colours- these are scraps left over from my felted wool sweater projects. (You can see how to felt sweaters wool here). You can of course use craft felt for this. I do prefer to use the sweater felt scraps as they are often thicker than craft felt and have more interesting textures. 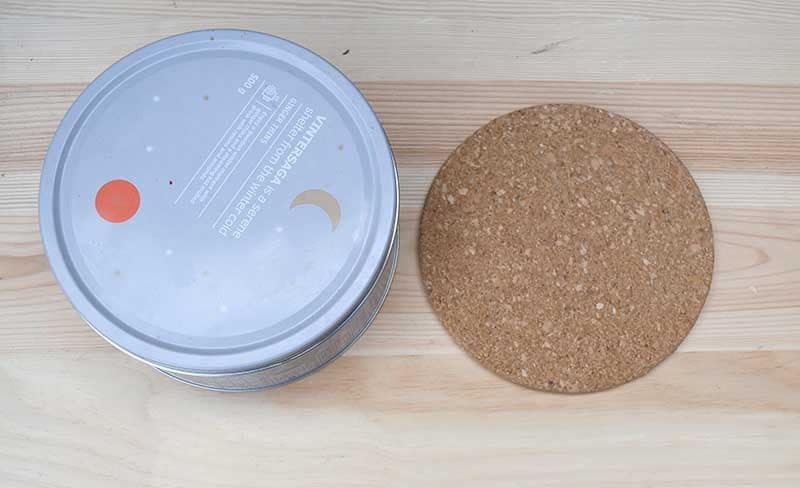 Old biscuit tin – I used one of the IKEA tins I had left over from their delicious Christmas cookies. I made several different felt succulents. The first lot I made were using a quilling technique similar to the paper quilled succulents here. Cut the felt into long 5mm strips with a rotary cutter. To make this succulent. 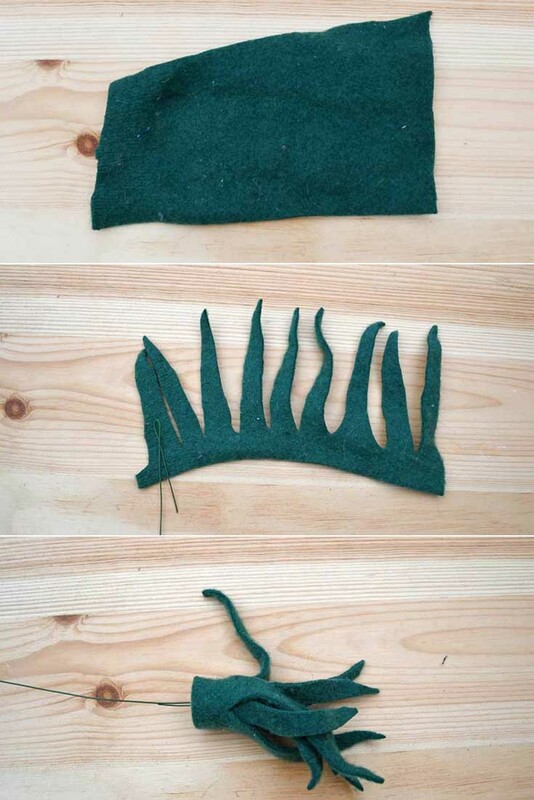 Paste one side of the felt strip with fabric glue and then wind it around floristry wire. Overlap the felt as you move down the wire. 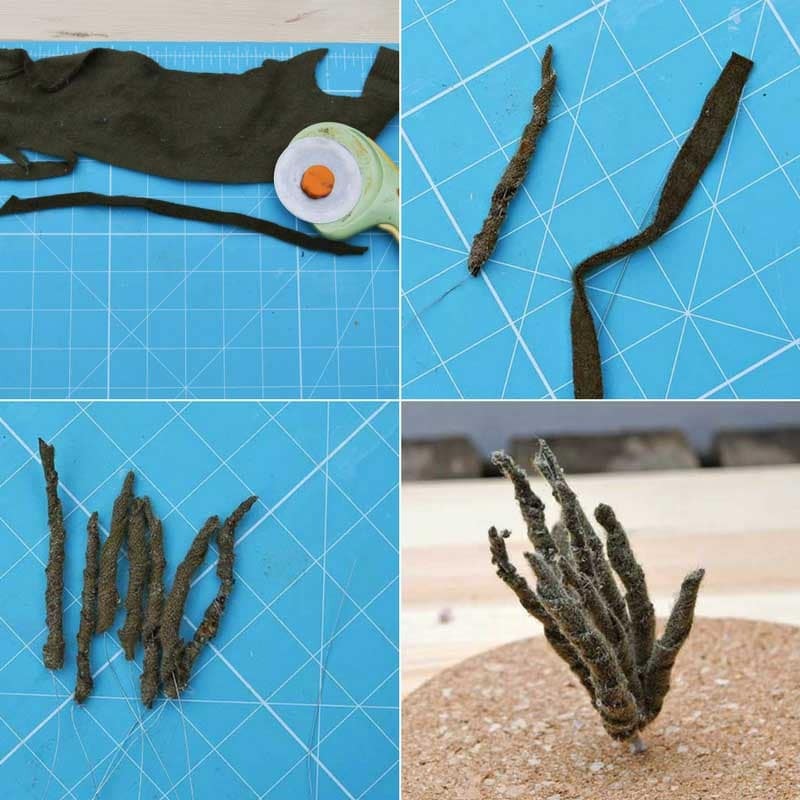 I made each spiky leaf about 6-7cm long and I made about 9 in total. For this succulent like I simply rolled my strips of felt into tight flat spirals. I used a dab of fabric glue on the end to keep it from unravelling. You will probably have to use a pin to hold the spiral in shape as the glue dries. I made 12 of these red spirals, five large and five small. Then using a glue gun I glued them into the succulent shape below. For these Other succulents, I used a slightly thicker felt strip and quilled the felt into a dome shape. With the tall green ones I cut some tiny flowers out of pink felt and stuck them to the top. I also hot glued floristry wire the bottom of each succulent. For this succulent cut a strip of sweater felt about 20cm in length with the width at 7cm one end increasing to about 11cm the other end. Then cut the strip into a zig zag leaf shape and curl up. Secure it with a dab or hot glue and add a wire stick to the base. 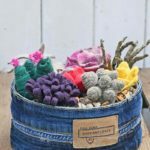 For this unusual succulent I used the cuff of a felted sweater. However you can get the same effect with a folded over piece of felt. 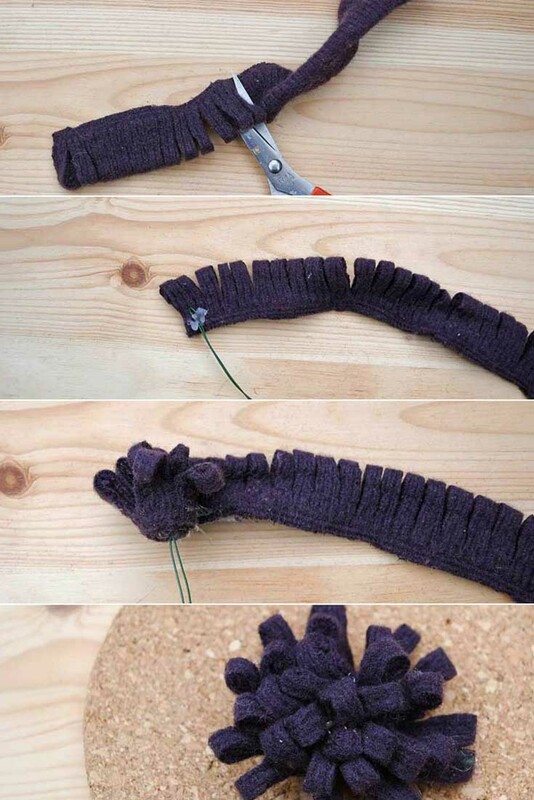 Fold a strip of felt about 20-25cm long and 8-10cm wide in half width ways. Cut slits into the felt about 5-7mm apart, don’t cut right to the end. Hot glue the wire stem on the edge and then roll and secure with hot glue. Using a template, cut out 6 large and 6 small felt petals. Glue the small felt petals overlapping slightly into a round. Repeat with the large petals. Stick the small petal round into the center of the large petal round. Don’t forget to glue on a wire stem to the base. 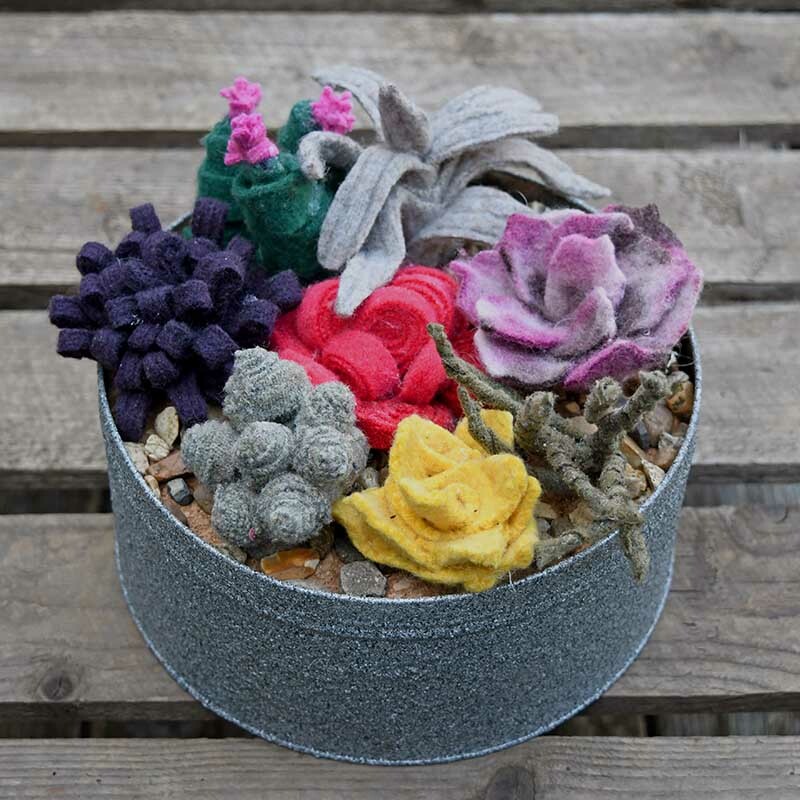 Use the cork trivet to assemble the felt succulent garden. Simple pierce the cork with wire stems on the succulent and thread the wire through. Arrange the felt succulents to fit all onto the cork board. It is so easy to move and change the succulents by using this simple method. If you already have a pot suitable for the succulent garden you can just use that. I actually found an old casserole dish that was the perfect size for these succulent gardens. 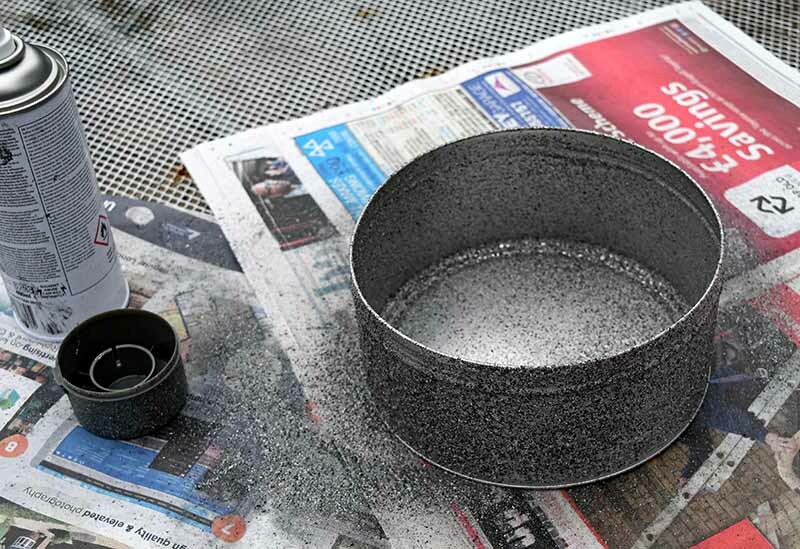 If not you can simply repurpose and old cookie tin by either spray painting it with the stone effect spray paint. 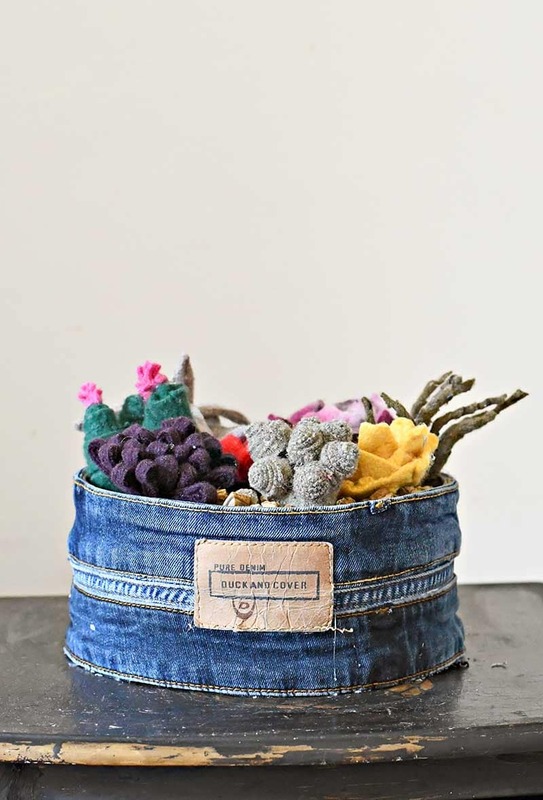 Or upcycling the tin with denim like my recycled jean planter. This is one succulent garden I won’t be able to kill through neglect, I’ll just have to give it an occasional dust. Also, it’s hardly made a dent in my felt scraps so I’ve got plenty more to make many more succulent gardens. I know Christmas is yonks away, but I fancy making a few of these as a gift. Great idea for a housewarming gift too. 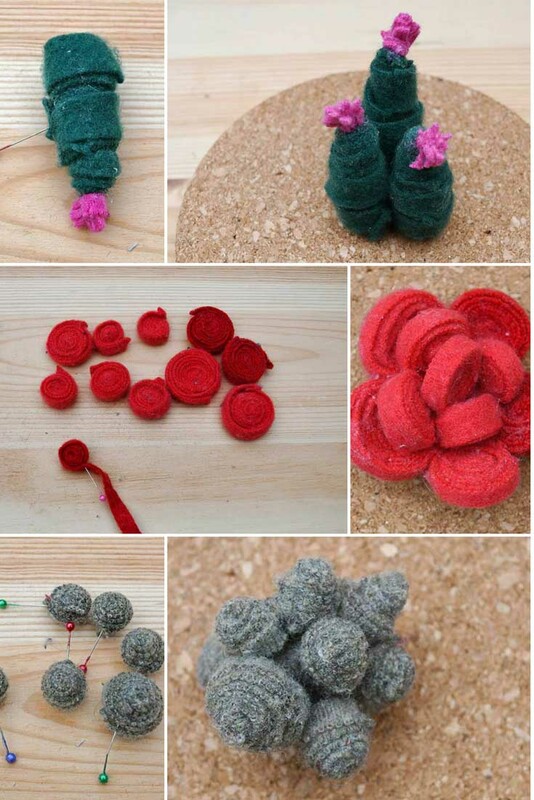 Don’t forget to check out my super cute scrap felt Christmas tree and other ways to repurpose old wool sweaters. This is such a cute ides, looks like fun to make! Thank you, it was fun to make. I want to make more! What a fab idea, that is absolutely beautiful! Thank you, I really enjoyed making this one. I just love succulents faux or real. Thank you, Caro. 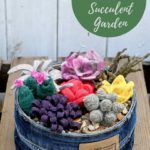 They are fun to make and there are loads of different succulents you can create. This is so cute, perfect for those of us who have a black thumb! Yes, this succulent garden will last forever, it just needs the occasional dust. First off, as a knitter I’m so in love with this. But there’s another reason too—we can’t keep any plants alive—except these!! We could actually have green thumbs with these succulents!! Thank you so much, Jodie. Such amazing work and detail. Thanks for sharing on To Grandma’s House We Go! Brilliant, this just looks like SO much fun. I have a very similar casserole dish to that out in our garage, it’s been used for plants from time to time for many years – very retro! Thank you, Julie. The colours and pattern make the dish look so retro. Very clever. At first look I thought they were real. Aww, thank you Lisa. It was really fun to experiment and play around with the scraps. So creative. 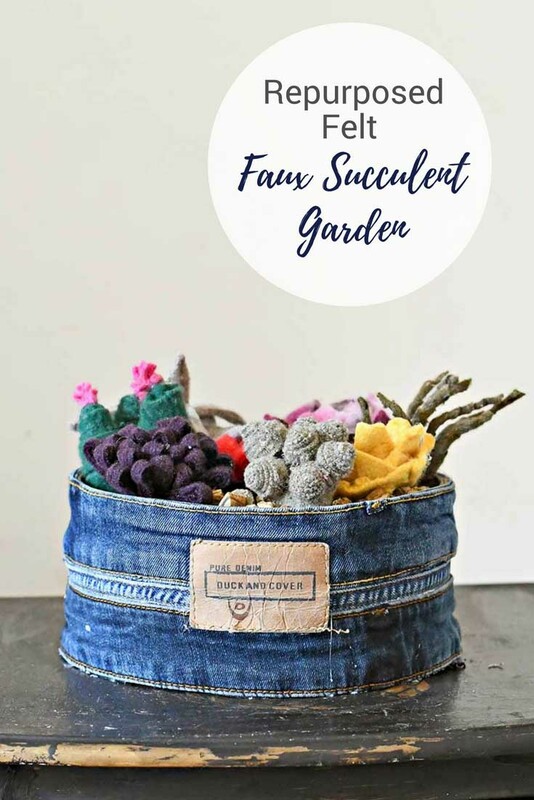 I especially like the denim planter cover. All teenagers and boys would just love it. Thank you so much Leanna. I like the denim too I think it goes really well with the wool plants. wow, wow, wow, Claire you have done it again! 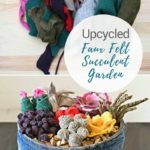 Amazing project and of course can totally relate to how satisfying it is to create something from recycled leftovers from another project! Thanks for sharing on craft schooling sunday! Thank you Sara. Not only is it Eco friendly but it costs nothing too! Thank you so much. I try to repurpose whenever I can. Love anything succulent! 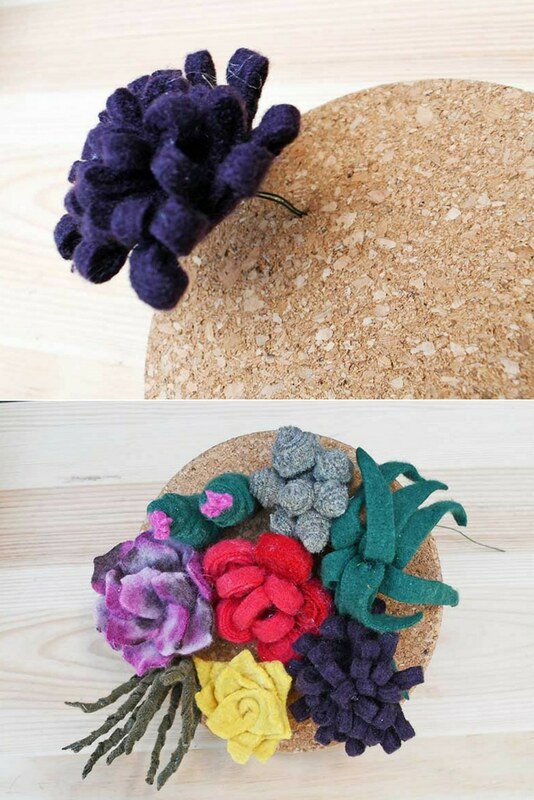 Your felt plants look very realistic. Visiting from BFF party. Thank you, Victoria. Yes, succulents are fun things to craft. You are so creative! 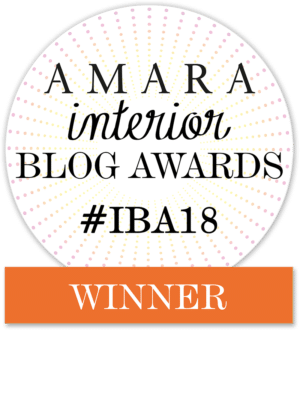 Thank you for sharing your fun posts at Vintage Charm! Thank you so much. It is fun to make.